This is a crochet tutorial on how to make the popcorn stitch. The stitch is fairly simple to make and creates a raised bump on either the front or the back side of the fabric. I happen to really like this stitch, but it tends to use up a bit more yarn than most other crochet stitches. There are several variations of the popcorn stitch, so always be sure to check the pattern for specific instructions. Basically, what you do is work 4-5 double crochet stitches into the designated stitch or chain. 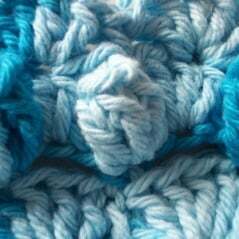 Once you have made your double crochet stitches, simply remove the hook from the loop and insert it into the first double crochet stitch that you made. You can either insert the hook through both loops or through the front or back loops only. I prefer to use both loops, but in some cases you might prefer to use only one. Then to close the stitch, simply pick up the dropped loop and pull it through. That connects the last double crochet to the first, and causes the center stitches to form a bump. If you like, you can work one or more double crochet stitches right beside the popcorn stitch. Or, you can also chain 1, and then skip the next stitch in order to give the popcorn stitch more room. You can work the stitch so that the raised bump shows up on either the front or the back side of the fabric. If you want the bump to show up at the front, simply work your double crochet stitches as normal. Then remove the hook from the loop and insert it from the front side of the work in order to pull the dropped loop through from the back. This generally is the method to use if the pattern does not specify from which direction to insert the hook. In order for the bump to appear at the back, simply work the double crochet stitches into the designated stitch or chain as normal. Remove the hook from the loop and instead of going in from the front of your work, insert the hook from the back to the front. Then as before, pick up the dropped loop and pull it through. This method pulls the right side of the stitches together in order to form the bump in the back. With the above methods you can work your popcorns into every row and have all of them show up on the same side of the fabric. The Beginning Popcorn Stitch. The beginning popcorn stitch is used when the popcorn stitch is the first stitch in any given row or round. It is generally started off with three chains, which count as the first double crochet. Then you work another 3-4 double crochet stitches into the same stitch or chain. Drop the loop from the hook as normal and insert it through the third chain. Pick up the dropped loop and pull it through to finish the stitch.